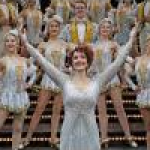 West End star Steph Parry is best known for starring in the award winning Drury Lane production of 42nd Street during the Summer of 2018. She also starred in Mamma Mia!, and made headline news when she was asked to take over the star role in the Abba Musical when the then star was injured. Steph Parry has also been in the West End productions of Wicked and Billy Elliot. She now appears in her own acclaimed cabaret show 'Broadway Meets West End' at London's famous cabaret room The Pheasantry, King's Road, Chelsea, on Sun 24th March. A rare oppurtunity to see this most talented actress / singer with some of the best of songs from musical theatre, plus some funny back stage stories. Magnificent! !